Operation Diagnose: This week I'll explore a variety of ailments that commonly afflict terrariums. A reader contacted me a with a bevy of floundering terraria (with accompanying photos). This affords a great opportunity for me to attempt to diagnose the problems and make suggestions - but I also encourage you to chime in and share suggestions or anecdotes in the comments! 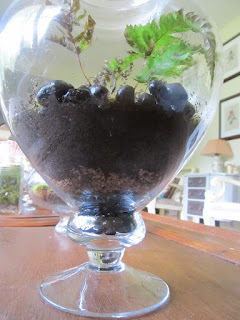 Question: We could really use your advice as we're having just a dickens of a time with our terrariums. Some are open, others closed, some with ferns, some are just moss, some "wild" from the yard and some revived... none are doing quite well. Ferns are loosing leaves or turning black. Mosses are browning or yellowing. Just can't seem to pin-point why. Answer: Today I'd like to discuss the success and demise of ferns in terrariums. TL:DR Answer: Ferns are tricky business. Unfortunately, it is trial and error for using a specific fern variety in a certain terrarium vessel. Nesting Ranch, your unhappy fern photos are a sad casualty of terrarium-keeping. Many people assume ferns love shade and lots of water but they actually span a wide variety of climates and conditions. Some ferns just can't handle terrarium conditions. Some ferns are better suited for certain sized or shaped terrarium vessels. Almost all of my "settled" terrariums containing ferns were replanted several times. I would try one type of fern, it would die, and I would start again from scratch. I would encourage you to experiment with different varieties of ferns. I've had great luck with the hardy and common sword fern but it gets tall and needs a tall, narrow terrarium. If you obtain a special or hard-to-obtain (aka purchased) fern you may want to divide it into smaller, self-sufficient plants to see if it takes to terrarium life and maximize the opportunities to try it out in different vessels. You can also keep the divided ferns in a wardian case or other holding zone to observe whether the plant thrives or shrivels in a terrarium environment.